Candice Craves: Apple Cinnamon Waffles Take 2! I toasted the waffles until they were crispy. This is important so they don't get soggy (unless you like soggy!). Then I chopped up the apple, sprinkled cinnamon and splenda on it, and heated it in the microwave for 3 minutes. 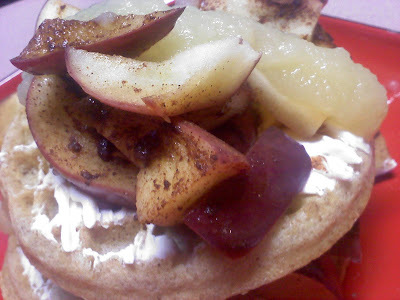 I spread 1 tbsp of fat free cream cheese on each waffle and topped it with apples. I topped the whole thing off with a big tbsp of unsweetened applesauce. This was like eating a decadent dessert at a restaurant! Very good and my belly fills happy and full.